Brody, also age 5, was spitting his out onto his dinner plate. Sooo, the chocolate eggs need to be a little less dark chocolate-y in our house, but everything else was really a hit! 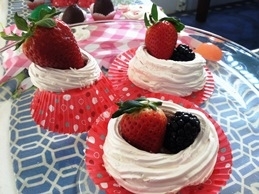 Vanilla Meringue “nests” with strawberries and blackberries inside. I was very excited about these because I didn’t know it was even possible to make meringue with honey instead of sugar. Fortunately, it is! Add egg whites, honey, salt and vanilla to the mixing bowl and heat on the stove over medium heat while whisking constantly for about 4 minutes. Once the egg whites are warm and frothy, transfer the mixing bowl to a stand mixer and turn it on high. Add teaspoon of cold water and continue beating on high for about 5 minutes until the meringue is glossy and holds stiff peaks. Now either drop the meringue by the spoonful onto a parchment lined cookie sheet, or fill a pastry bag and pipe it into the shape of a nest onto the cookie sheet. If you want to sprinkle coconut on it, do that now. Bake it in a 175 degree F oven for 1.5 to 2 hours until dry and hard. You don’t want the meringue to brown, you’re just drying it out. Once dry, turn the oven off and let sit for another hour in the oven. Chocolate covered pretzels. These are highly addictive! I used Unique brand pretzels because they’re made with 100% whole wheat, and then spread them with a chocolate topping. While the chocolate was still wet I sprinkled a variety of extras on them: sea salt, shredded coconut, chopped peanuts and left some plain. The chocolate topping is a breeze to make, and if you’re not a fan of coconut you can grind some oats up in your food processor and use those instead, or leave the coconut and oats out all together and end up with a smooth chocolate. 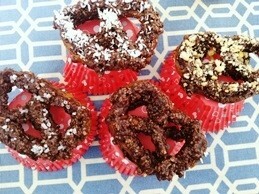 The coconut (or oats) helps to make this chocolate a thick topping for the pretzels. Mix all ingredients together and spread over pretzels. Immediately transfer the pretzels to the freezer for at least 25 minutes or until chocolate hardens. 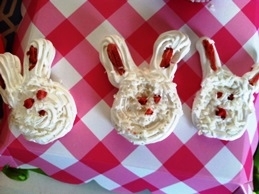 Meringue bunny faces. For these bunnies I made the above meringue recipe and just piped it onto my cookie sheet (lined with parchment paper) into the shape of bunnies. I cut freeze dried strawberries into slices for the pink ears and used little pieces of dried strawberry for the eyes and nose. Before cooking I sprinkled the faces with a little shredded coconut. Marshmallow “peeps”. These little guys will convince you to never buy packaged marshmallows again! They are so easy to make and so good they practically hop right into your mouth. Just use the marshmallow recipe and cut them into shapes with small cookie cutters. 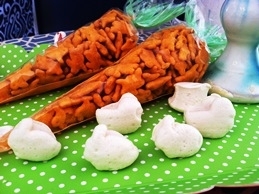 The “carrots” in the background are clear bags filled with Annie’s Bunny Crackers. I found the bags at Michaels and they come pre-printed with a green carrot top. Chocolate pretzel bundles. 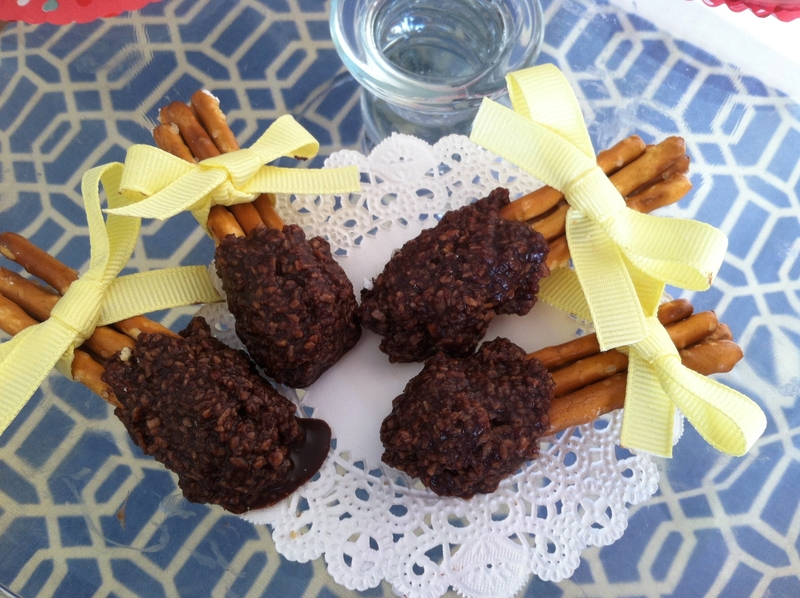 To make these cute little pretzel stick bundles I just tied 5 sticks together with a 3/4″ ribbon, dipped the lower half in the above chocolate recipe and then let them harden in the freezer. Be sure to keep them in the refrigerator when done because they’ll start to melt after a while at room temperature. And last, but not least, the chocolate eggs. I put peppermint extract in my chocolate to make this a little minty, but you could put any flavor you like in it or just leave it plain. I also added chopped peanuts into the middle of some eggs and shredded coconut into others. To make eggs that look like this just use plastic Easter eggs as a mold (be sure to spray the inside of each egg mold with non-stick spray!). Optional filling ideas: chopped peanuts, shredded coconut, peanut butter whisked together with a little honey, etc. Process all ingredients in a food processor. 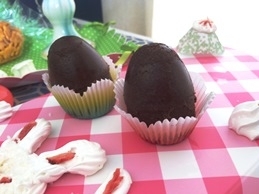 Pour chocolate into candy molds or small muffin tins that have been sprayed with a non-stick oil. I used coconut oil. Transfer to the freezer for about 3 hours. To make the eggs in the picture I used plastic Easter eggs and filled each side of the egg with chocolate. Be sure to spray the inside of your eggs with a non-stick spray or grease them with coconut oil. If adding a filling, do it now. I spooned a little bit of chopped peanuts into the middle of the chocolate on one side of the egg, on others I spooned some coconut, and I left a few plain. When both sides of the egg are 95% filled (you want to leave a tiny bit of room so the chocolate doesn’t squish out from the middle and prevent the egg from snapping shut), quickly snap both sides of the egg together. I put the eggs into my small muffin pan to help them stand upright in the freezer. This recipe makes 6 regular size Easter eggs. I think smaller eggs would be even better, but I couldn’t find any. Makes about 12 mini-muffin size chocolates. If you have any ideas for other junk free Easter treats, I’d love to try them! Please post them in the comments area! 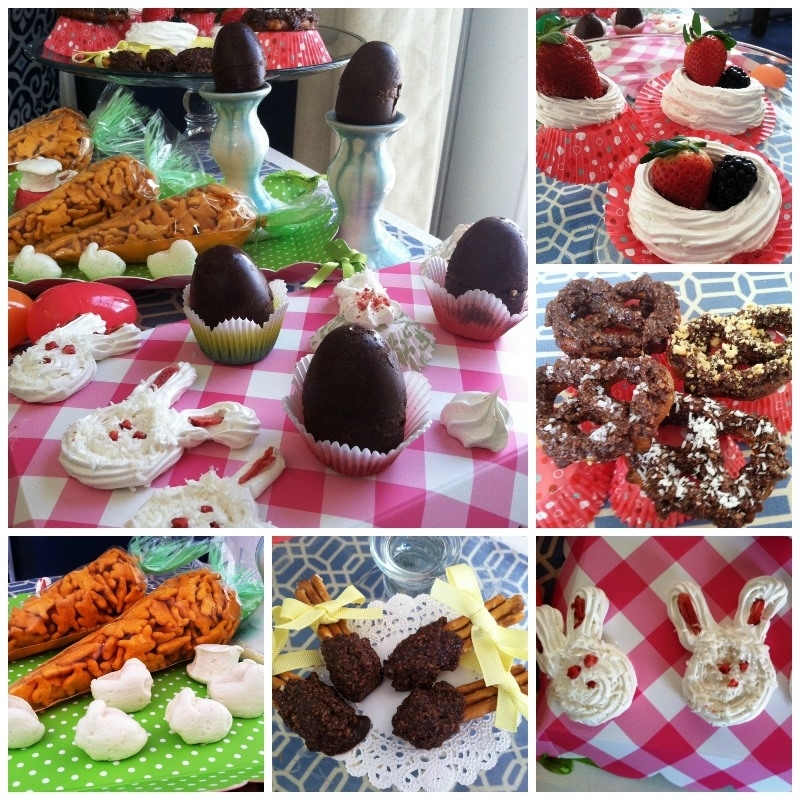 chocolate, Easter, honey, meringue, real food, refined sugar-free, treats.